The idea of digital tools to organize your life is great – something to make your day less confusing and tiring. But the problem is there are so many tools out there that your life becomes more confusing and tiring in the process of deciding what to use. With a team that has downloaded almost 100 such tools, here are ten that stand out from the crowd. 1. 1Password: How many times have you forgotten your password and had to press the reminder button? Or do you have an Excel spreadsheet titled passwords, which kind of defeats the purpose of passwords in the first place? 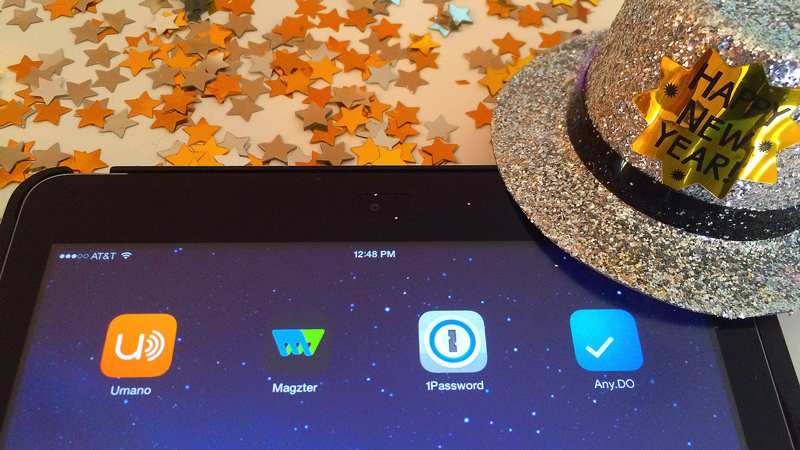 To use 1Password, you add all of your usernames and passwords, and then synchronize it across your devices. 1Password is encrypted to remain secure at all times. 2. Unroll.Me: Is your inbox cluttered with advertisements and subscription emails? Has it become so bad that you use an alternate email? With Unroll.Me, you first unsubscribe to subscriptions that you are no longer interested in, and then it combines the subscriptions you want into one daily digest. Problem solved! 3. Get Sh*t Done! : Sometimes a little tough love is all you need. In this crude app, you assign yourself a task, set the timer – and then add a reward for success and a punishment for failure. The app coaches you along the way and to keep you from procrastinating. 4. Any.do: If you’re like me you love lists, but sometimes the idea of taking the time to create a list is more overwhelming than how many items you need to put on it. On Any.do, you add tasks via typing or your voice. The voice part is the highlight here for me. Then when you finish a task, you shake your phone to mark it as complete. Everything is synced to Any.do’s website and accessible from any device. Another excellent feature is you can share tasks, attachments, sub-tasks and conversations – which is great for business. 5. Key Ring: Do you have so many things on your keychain that you feel like a security guard? Do you have a separate set of keys for when you run to the gym or for a night out because your usual set doesn’t fit in your pocket? Key Ring puts all your loyalty cards on your phone, and then you scan them straight from your phone at the checkout counter. You can also make shopping lists and it has coupons at select retailers. 6. Magzter: As much as I love the feel of a book, when you are on the go it’s nice to be able to have a digital newsstand at your fingertips. Magzter is the world’s largest and fastest growing cross-platform global digital magazine, bookstore, and newsstand. Whether you want something to read for fun or to keep up-to-date on industry news, Magzter organizes your subscriptions in one, easy to navigate app. 7. IFTTT: The name says it all “If This, Then That.” We all have things that we always do if an action happens. Why not put the internet to work for you and have it automatically done each time? For example: If I load a photo to Instagram, then add the photo to Dropbox. Done and done! 8. Umano: The best part of the Internet is that everything is available with a simple Google search. The worst part, there isn’t enough time in the day to read everything you are interested in. Umano picks out prime articles from your favorite new sources and turns them into audiobooks. They also recommend additional articles based on your listening history. You can download playlists to listen to when you are offline and on the go. 9. Agent: We all would love a personal assistant, but not everyone has the budget. This free app silences your phone during meetings, only lets urgent calls come through at night, remembers where you park, reads text messages while you are driving, and you can dictate the text message responses. With a few minutes of setup, you have your very own virtual personal assistant! 10. EasilyDo: What if there was something that alerts you to important emails, tells you when new songs comes out, shares free apps of the week, reminds you to pay your bills, keeps note of your travel arrangements, and provides you with directions? Well, lucky for us, EasilyDo is just that. It organizes your life down to every last detail. EasilyDo is initially overwhelming, but if you take the time upfront to set it all up, it will save you time later and is incredibly worth it. My favorite part is it takes your data and summarizes it into a Pinterest friendly format of how to navigate your day.